Anyone familiar with high class, "real deal" working dogs knows there is a big difference between the animals registered by the same name with the American Kennel Club and the working animals performed by serious fanciers and not registered with the AKC. I'll show a few examples below. The English setter is a breed divided. 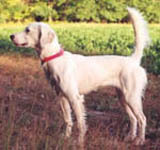 While all English setters come from the same stock of dogs (like pit bulls and Am Staffs) they too have been divided by those who breed for show wins and those who breed for bird hunting. 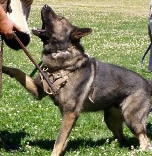 The show dogs are large, have flowing coats and thick muzzles and heads. They lack hunting drive, are calm and quiet and their long coat makes them worthless for use in the field. 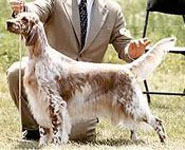 Field bred English setters are small (30 to 55 pounds), wiry, and have very sparse coat. They are hyper, high drive dogs full of bird sense. Which dog you like depends on your point of view. The dog on the right is from Susan Butcher's yard. She won the Iditarod race four times. The dog on the left is an AKC Siberian husky. No serious racers use purebred AKC siberians anymore. The AKC huskies are pretty, but they are not as fast or tough as the dogs now called "Alaskan husky" to differentiate them. 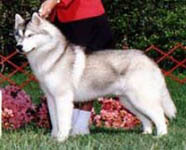 They show husky would be laughed off the sled dog track, the working husky would be thrown out of the show ring. Same breed? CLICK HERE: for a great article on the difference between AKC and working huskies. German shepherds are also a breed divided. There are show bred dogs, working bred animals, and hybrids. There are also "East German lines", "West German lines", "Czech lines" and more. Each has its followers. While they all share the same breed name, they all have distinct characteristics. Like the pit bull breed, true, experienced fanciers can tell the difference by appearance. Some breeds, like the greyhound, have distinctions noticable only to the expert eye. But they are there. The show bred animal has a long, thin neck, overly deep chest and is quite large - much larger than they want them at the track. 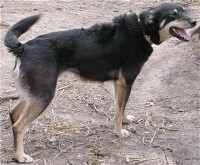 The track dog on the right has a shorter, stronger neck, a less exagerated chest, is noticably stronger in build and smaller. Why smaller? The more "medium" dog has better stamina and wind. Interestingly, when expert sled racers were asked, they agreed that the correct size for a working husky is: "Ideally, the females should be 45 to 50 pounds, and the males between 50 to 55 pounds. It is important that they are no heavier than 55 lbs. because that seriously compromises their speed, resilience, and endurance". What makes a show bred dog "better" or "worse" than a performance bred dog is simply a matter of choice. Many people are far better suited to owning a show or pet bred dog than one bred for intense work. Working dogs are often too much dog for the average pet owner. One nice thing about purebred dogs is there are so many choices that one breed or type is likely to be a fit with any home. However, for serious students of the American pit bull, it is important to understand what is a "real" pit bull and what is not. Go to the next page to find out about The Pretenders.